March 14, 2017, 10:23 a.m.
Plus: The huge success of Missing Richard Simmons, windowing expands as a strategy, and The New York Times’ podcast-as-EP. By Nicholas Quah March 14, 2017, 10:23 a.m. Welcome to Hot Pod, a newsletter about podcasts. This is issue 111, published March 14, 2017. Infinite Dial 2017. The latest Edison Research report capturing the size of podcast listening audience is in, and growth continues to look pretty solid. However, just how we should feel about that growth appears to be a debated question among some pockets of the community — there were, to be sure, many observers who were expecting a greater acceleration in listeners following a year of solid media exposure to the medium, and they didn’t quite see that this year. Before jumping into the numbers, some background: the Infinite Dial report comes from Edison Research in partnership with Triton Digital, and it examines consumer adoption of digital media with particular emphasis on audio. It’s also the most reputable independent study that has researched the state of podcast listenership since the medium’s inception, with data going back to 2006. The study is survey-driven, offering a complementary data source for an industry largely defined by a black box platform and which possibly looks to further fracture across several other black boxes as it moves into the future. Which is all to say, the study presents us with the closest, most trustworthy read of the actual market we’re dealing with. The share of Americans who report being monthly podcast listeners (the key metric in my mind) is now 24 percent (67 million), up from 21 percent (57 million) the year before. That’s a 14 percent (or 3 percentage point) growth year-over-year. The story is more dramatic if you take a longer view: Over the past two years, monthly podcast listening has grown by 40 percent. However, the monthly podcast listening growth between 2017 and 2016 (3 percentage points) is a little less compared to the period immediately preceding it (4 percentage points off a smaller base), which has become a source of consternation among some in the podcast community. More than a few people have written me noting the disparity between the hype that we’ve been experiencing — about how 2016 was supposed to be “the year of podcasts” — and the steady, seemingly unsexy growth we’re seeing here. — We’re also talking about solid, continuous growth following years of marginal gains (and a dip in 2013) in terms of active podcast listeners, and what are essentially years of non-movement in terms of podcast awareness. Between 2010 and 2013, podcast awareness hovered between 45 and 46 percent of Americans. Which isn’t to say that continuous growth is inevitable in Podcastland, of course. Far from it. The industry has a crap ton of work to do, and the bulk of it should revolve around this next topic. [One thing] I find significant, that no one is discussing — and is podcasting’s massive opportunity — is the disconnect between occasional users and regular users. To me, the fact that 40 percent of U.S. adults have tried podcasting, yet only half of them listen regularly, that’s astounding. Show me any other medium that has that gap. None. When people sample and don’t habituate, it speaks to interest that isn’t being met by the content that’s available today. There either isn’t enough variety of things for people to listen to — or there isn’t enough of what they like to meet their appetite. With 350,000 podcasts, that seems like a strange thing to say, but the simple truth is that potential listeners aren’t sticking with it — and there are only two potential reasons: not enough good stuff — or they simply can’t find it. Solving this could go as far as doubling the audience for podcasting. In all, I see this year’s report as clear evidence that there is a lot of headroom left to go, but I think it’s time to stop blaming awareness as a core problem. 40 percent of Americans [112 million] report having ever tried listening to a podcast, up from 36 percent the year before. Again, 24 percent of Americans report sticking around to becoming monthly podcast listeners. Thus, to speak personally for a second, my discovery of the things that I tend to stick with, both on the Internet and in podcasts, come from the same three broad avenues: (a) the thing earns its place in my attention sphere by bubbling up across my existing circuits, (b) I personally go out and dig for a specific thing through various search pathways, and (c) somebody personally recommended that thing to me. And all of those processes of discovery are driven, anchored, and defined by the nature of those things and whether they are actually things that I would sort into my life based on my consumptive predispositions. (Sorry for the many uses of the word “thing.”) Which is to say: No matter how much you try to fix discovery processes, the act of discovery necessarily breaks down when the things that people want don’t exist. The problem of programming, then, should necessarily supersede the problem of discovery among any and all media entities that fundamentally struggle with the boundaries of their potential. We see this idea express itself in another data point, and observation, raised during the Infinite Dial webinar last week. The presentation had highlighted the fact that podcast consumption among the oldest demographic (55-plus) is pretty low — making up only 12 percent of the American monthly podcast listening population, up from 11 percent last year — which is a finding that, as Edison Research’s Tom Webster pointed out during the presentation, is a little strange given the talk radio format’s general popularity among that age demographic. “Now, certainly, one growth area for podcasting is to continue developing content and to market to older Americans,” Webster said. But that’s not to dispute Webster’s argument here, because its core idea is true, crucial, and worth fighting for at every turn. We need to be developing more types of programming for more types of people, shows that are of and for: more women, more people of color, more older people, more different kinds of communities, more nationalities, and so on. Podcast consumers listen to an average of five podcasts per week. And to break that out further: More than half of all podcast consumers listen to three or more podcasts per week, and over a fifth of podcast listeners listen to six or more per week. The average number of podcasts that listeners subscribe to: 6. Perhaps the most notable finding: 85 percent of podcast listeners say they tend to consume the majority or the entirety of the episode. As Izzi Smith, NPR’s senior director of promotion and audience development, pointed out to me over Twitter, these are self-reported numbers and should therefore be taken with a grain of salt. The move here, then, would be to compare that against the internal analytics findings of various podcast publishers who have the means of measuring the behaviors of their own listeners — and of course, mentally accounting for potential differences between the specific quirks of those publishers’ audiences and the more general aggregate behaviors of all audiences combined. HowStuffWorks chief content officer Jason Hoch tells me that the Infinite Dial numbers were consistent with data pulled from a streaming partner. “We see ~50% do ‘half’ and 35-40% do all of an episode,” he tweeted. Nick DePrey, NPR’s analytics manager, tells me that “NPR One data shows 65 percent of listeners hear more than half the audio and 46 percent hear the whole thing, but that’s only half the story. These broad averages conceal the most important factor: Length is everything in determining completion rates.” He went on to discuss the specific findings, which you can find on the Twitter thread. Active podcast listeners still skew male. The home is still the most common place for podcast listening. It’s still early days for in-car podcast listening. That’s all I got for now. The future looks strong, though it looks as if the present still needs to catch up. Again, you can find the whole Infinite Dial 2017 report on the Edison Research website — there is a ton of good stuff I didn’t touch here, so go check it out. The research team is scheduled to publish a report that digs even deeper into the podcast data sometime in May, so watch out for that. Quick note on Missing Richard Simmons. The smash-hit, massively popular, [insert maximal adjective here] podcast is wrapping up its six-episode run next Wednesday, and soon, we’ll find out whether we’ll actually hear from the titular subject himself. But I was also curious about the show’s windowing arrangement with Stitcher, in which episodes were released a week early on Stitcher Premium, and whether it would still apply to the final episode, which I imagine would significantly deflate the momentum leading up to the big reveal. Midroll, which owns Stitcher, tells me that the final episode will indeed be released early on Stitcher Premium, but instead of publishing tomorrow, the episode will come out next Monday — two days before everybody else gets it. Cool. I’ll be listening. Also, it occurs to me that, among other accolades, Missing Richard Simmons stands out as being a podcast that has achieved considerable success — it has sat at the top of the iTunes charts for several weeks now (caveats on the significance of iTunes podcast chart placement applies) — without any promotional placement from iTunes itself. I can’t quite recall another example of a podcast for which this has been the case, and that’s super interesting, to say the least. Two platforms, two pieces of news. So the first was the development I was referring to in the preamble of last week’s newsletter, and the second threw me for a loop. (1) Google Play Music rolls out its own original podcast. City Soundtracks features biographical interviews with musicians about the elements — in particular, places — that shaped their aesthetic lives. The podcast is hosted, appropriately, by Song Exploder’s Hrishikesh Hirway, and Google Play Music contracted Pineapple Street Media to handle production. The show’s distribution isn’t exclusively limited to the Google Play Music app; it can also be found just about everywhere else, including iTunes. It is not, however, available on Spotify. The first three episodes were released last Wednesday, when the show was first officially announced. Spotify and WNYC Studios, the premiere podcast and audio producer, today announced a partnership to showcase many of WNYC Studios’ top podcasts on the platform. The partnership includes a special two-week exclusive on Season 3 of WNYC Studios’ hit podcast 2 Dope Queens, premiering on March 21, before it becomes available on other platforms. All podcasts will be available to both free and premium users. I’m still mulling over just what, exactly, these two developments tell us about the growing dynamic between the rise of various platforms and how content will flow through the podcast ecosystem in the near future, but I will admit that this move from Spotify — that is, carving out a windowing arrangement with a non-music oriented show — seemed a little confusing to me. I had originally interpreted the programming strategy for both Spotify and Google Play Music as instances in which these platforms were integrating shows that would vibe with their music-oriented user base. To me, that’s the focused, albeit more narrow, play. But this arrangement with 2 Dope Questions opens up that strategy a little bit, and gives the entire enterprise a little less definition than before. Will it pay off? Obviously, that’s the question everyone and their second cousin is asking. Quick note from SXSW: ESPN’s 30 for 30 podcast. The Jody Avirgan-led team produced a panel on Sunday about the upcoming audio iteration of ESPN’s (and Bill Simmons’) beloved sports documentary brand. A couple of details for those, like myself, keeping a close eye on the project: The podcast will be released in short batches, with the first five-episode season dropping sometime in June and another five-episode season dropping later in the fall. Episodes are within the classic 30-40 minute range, and the podcast will follow the film’s anthology format in that no two episodes cover the same story. The panel revealed two out of the five subjects from the podcast’s upcoming first season: One will tackle the first all-women relay trek to the North Pole that took place in 1997, and another will examine the curious case of Dan & Dave, the 1992 Reebok advertising campaign rolled out in the runup to the 1992 Olympics that focused on two decathletes. Rose Eveleth is leading the former story, while Andrew Mambo leads the latter. And here’s a second mention of Hrishikesh Hirway in today’s newsletter: He’s handling the theme music. (Hirway has worked on the theme music for FiveThirtyEight’s podcast.) Ryan Ross Smith is scoring the individual episodes. I’m super excited about this — the panel played two short clips from those episodes, and they sound really, really good. That’s a hopeful sign, as the team has a lot to push through. Beyond the basic requirements of producing a good show, the team has to balance between meeting the brand expectations while ensuring the episodes have standalone value for non-30 for 30 fans, weaving together stories that are appealing to both the sports literate and non-sports literate, and finding ways to push certain conventions of the audio documentary format without entirely losing the core audio documentary consumer. Still tracking that West Virginia Public Broadcasting story…and it looks like the station is anticipating having to lay off 15 full-time staffers — more than 20 percent of its workforce — in preparation for cuts to its state funding as proposed by West Virginia Governor Jim Justice, as Current reports. WVPB GM Scott Finn told the West Virginia House Finance Committee last Wednesday that, should the state funding cuts go through, it places West Virginia at risk of being the first state in the country to lose public broadcasting, according to West Virginia Metro News. Gov. Justice’s proposition to eliminate state support for West Virginia Public Broadcasting was ostensibly to close a $500 million budget gap. Cutting WVPB from the budget would save a mere $4.5 million, and some have hinted at an alternative motivation for Justice to strike the state-supported journalism operation from the budget. One more thing. Just wanted to quickly shout-out The New York Times’ latest audio project, The EP. The podcast was produced in partnership with The New York Times Magazine for the latter’s second annual Music issue, which came out earlier this week, and the show is fascinating on a bunch of different levels: Its structure mimics the feel of a digital music album, each episode is bite-sized, each features a very tiny snippet of conversation with a critic about a specific song that nonetheless feels like the perfect capsule from a much longer discussion, and if you look down the feed’s release date column, you can see evidence of some sneaky CMS hijinks to create the track sequence. And most importantly: The podcast is really, really good. It’s one of those projects that’s so good, so smart, and so…new that it makes me very, very angry. It’s gorgeous. Go listen to it. The EP was produced by the internal NYT audio team, which is led by Samantha Henig and Lisa Tobin. I hear podcasting was a category on Jeopardy last night. Answers (questions?) included Keepin’ It 1600, Alec Baldwin, and Reply All. 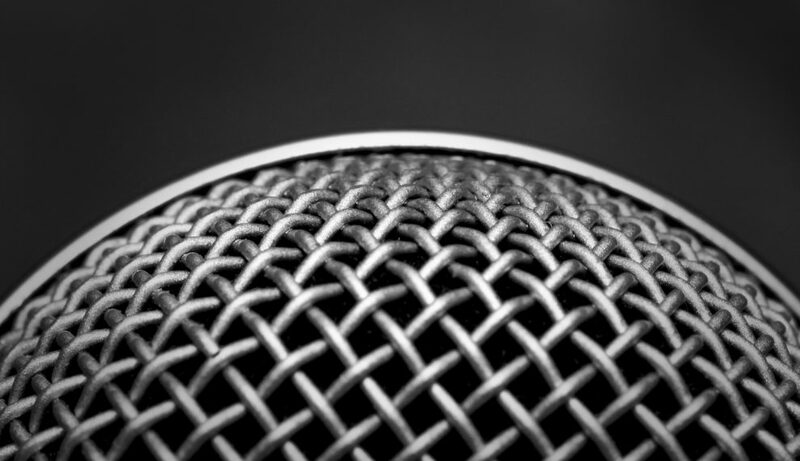 Obligatory photo of a microphone by TVZ Design used under a Creative Commons license. POSTED March 14, 2017, 10:23 a.m.
Quah, Nicholas. "The future of podcasting is strong, but the present needs to catch up." Nieman Journalism Lab. Nieman Foundation for Journalism at Harvard, 14 Mar. 2017. Web. 19 Apr. 2019. Quah, Nicholas. "The future of podcasting is strong, but the present needs to catch up." Nieman Journalism Lab. Last modified March 14, 2017. Accessed April 19, 2019. https://www.niemanlab.org/2017/03/the-future-of-podcasting-is-strong-but-the-present-needs-to-catch-up/.